This book builds a semantics for several kinds of future-referring expressions, including will sentences, be going to sentences, and futurates. While there exists previous work on future-referring expressions, this is the first treatment of such a variety of expressions in a formal semantic framework. Arguments presented herein explicate the meanings of these expressions, and account for similarities and differences among them. Shared is a future-oriented model with a systematic alternation between inertial and bouletic ordering sources that provide a new way of understanding the age-old future Law of the Excluded Middle, evident in all of the future-referring expressions. A difference found among these meanings is the presence or absence of progressive- or generic-like aspect in a position higher than the future modal. These very high aspectual operators affect the temporal argument of the modal's accessibility relation, with detectable effects that can be used to determine scope relations in future conditionals. 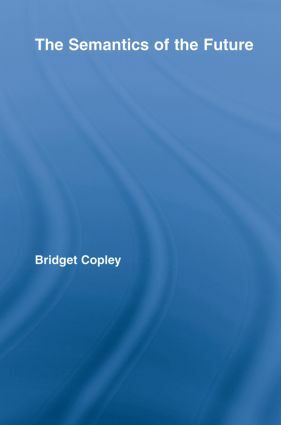 Copley's analysis thus addresses a number of issues of great interest to formal semanticists, from modal and aspectual semantics, to the mapping of functional elements in the clause, to the logical form of conditionals.